About 30 Golden & Area A residents took a walking and rolling tour with local hosts to learn about the Golden of the past, what projects are underway and to share their ideas for improving improving sense of belonging throughout the community. Starting and ending at Purcell Coffee on 9th Ave N, the group strolled through the historic downtown, down along 10th Ave N, over the street bridge; across to Kusheen Park, the Civic Centre, and Masonic Hall, before crossing back 10th Ave S, visiting one of Golden's many lanes; down the newly-improved Kicking Horse River dike; over the pedestrian bridge to Centennial Park and the Whitetooth Brewery; down 8th Ave N and back to the start. Your hosts were Colleen Palumbo, Museum and Archives Manager, Golden Museum; Phil Armstrong, Planner, Town of Golden; and Ryan Watmough, Executive Director, Golden & District Community Foundation. 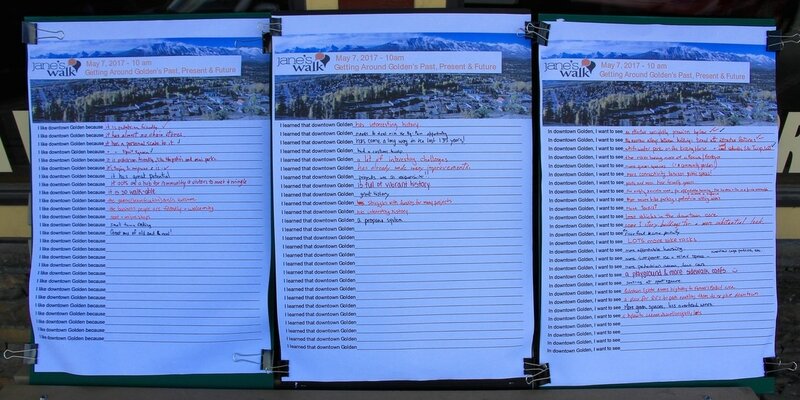 As part of the Community Foundation's Vital Conversations, and in keeping with the past, present and future theme, participants were asked to complete 3 statements at the end of the walk. 1. I like downtown Golden because __________ . 2. I learned that downtown Golden __________ . 3. In downtown Golden, I want to see __________ . The replacement of the Highway #95 bridges over the Kicking Horse River will negatively impact the views from downtown, as the bridge deck will be 4m above the current bridge. Also, by straightening out Highway #95 and removing the chicane, traffic speeds will increase considerably and may result in splitting the town in half (east & west). Further, at this point, there is no commitment from MoTI that a pedestrian underpass will be constructed along the desire lines on top of the south side of the Kicking Horse River dike. Without this, it will result in pedestrians crossing 4 lanes of traffic. With the new Highway #95 bridge, there is an opportunity to realign Highway #95 so that is adjacent to the CPR tracks (pushed to the east) . This change will result in the loss of the former train station/current Chamber of Commerce, but it could provide the opportunity to add more parking on the west side (present day Main St.), which would help improve pedestrian flow downtown. Further, this could result in a Farmers' Market that is located downtown, which would also support downtown retail, restaurants, and arts & cultural events. This is a once in several generations opportunity to significantly tweak the downtown. Examine the pedestrian and traffic flow. Have more conversations with locals and visitors. Write letters to the Town of Golden and MoTI. Thanks for celebrating your riverfront in Golden! 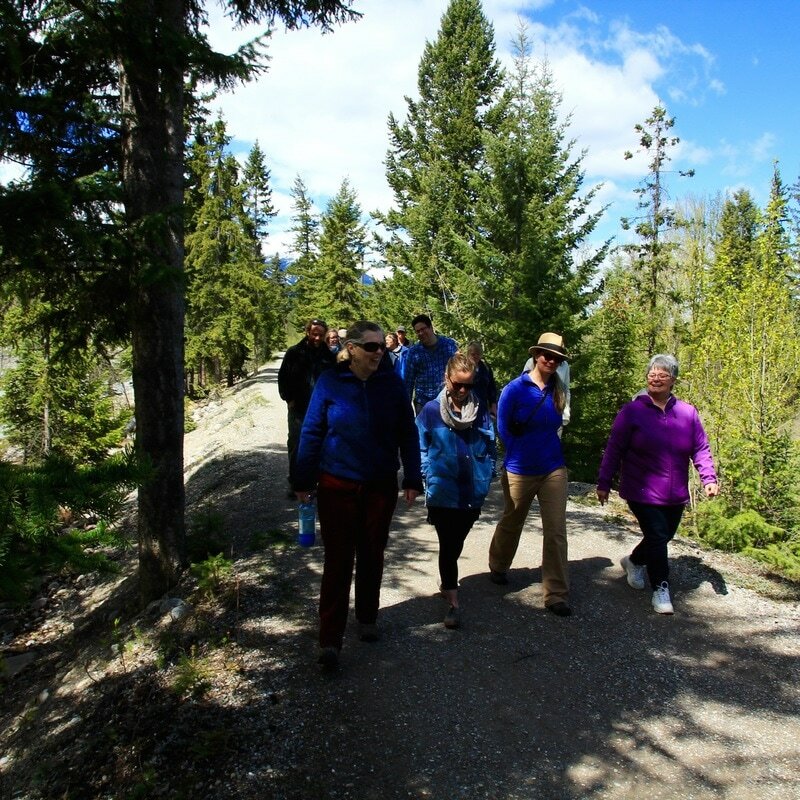 A very informal Jane's Walk (named after Jane Jacobs, the very influential urban activist) & Roll was held at 10am on Saturday May 7 and Sunday May 8, 2016, at the Kicking Horse Pedestrian Bridge. "Allow only 1-way traffic on 9th Ave N (downtown), adding more parking along the street"
"Pedestrianize 9th Ave N (downtown) to promote walking and reduce noise"
"Re-examine Town's Parks, Trails & Transportation Map to better align pedestrian access with MoT's Highway plans"
"Increase cycling infrastructure so most people can bike to and from work. I didn't have a car in Denmark until I was 25 and I did not need one!" "Continue to tweak amphitheater seating in Spirit Square to add capacity and improve traffic flow during events"
"Examine public access for Crown Land on east tip of Gould's Island"
"Improve sidewalk tie-ins to pedestrian trails and directional signage further into the centre of downtown and residential areas"
"Whitewater park and surf waves in highly visible locations"
"A few steps down to the overflow channel for an area to cool your feet in the summer"
"A pedestrian underpass would be a great idea so that you don't have to hold up traffic on 10th Ave/Highway 95"
"Fixing that alley so people and businesses can face the river"
Jane’s Walks can be educational, and a lot of fun. You can meet your neighbours, make new friends, and exchange business cards with new contacts. You can learn something new, and share what you know. But there are some big ideas behind these walks as well -- and they come from Jane Jacobs, the organization’s namesake. Jacobs believed in walkable neighbourhoods, urban literacy, and cities planned for and by people. That is, for a city to work, the people who live there must be involved in decisions about how the city grows and is run. Staying informed about civic issues, learning the basic concepts of urban planning, and meeting the people who make the decisions are all good ways to do this -- and are all things you can do on Jane’s Walks." For more info, check out Janeswalk.org. 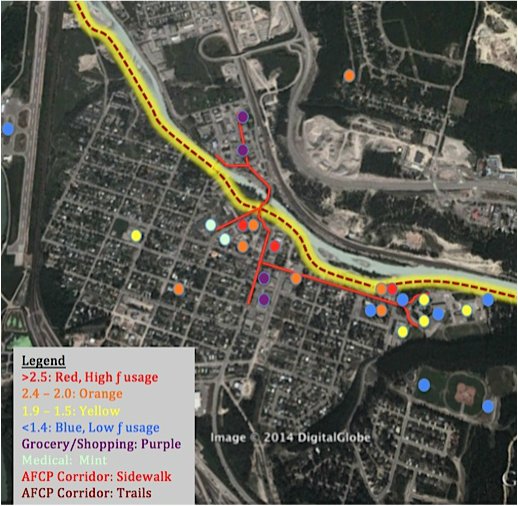 Age Friendly Corridor Concept Map (left): The above map shows the frequency of use of public buildings in Golden, according to 200 survey respondents of the 2014 Age Friendly Community Plan. 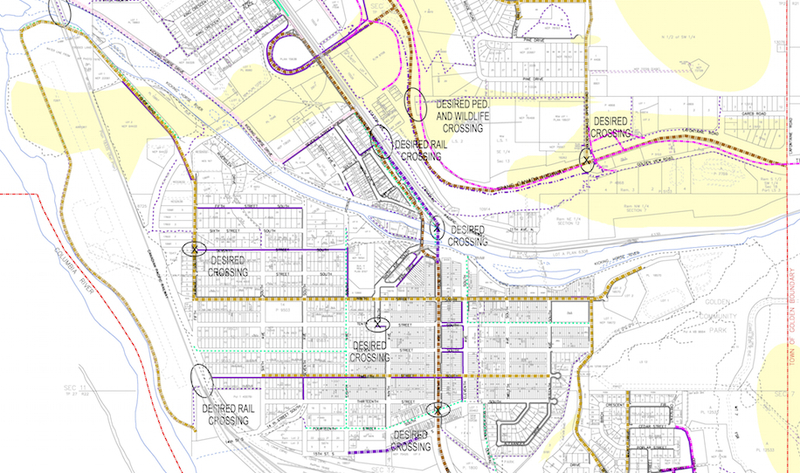 The red and yellow lines suggest sidewalks and trails that would best connect the most frequently used locations, and which should receive priority maintenance winter and summer. Town of Golden's 2008 Schedule E - Parks, Trails & Transport Map (above): Many of the pedestrian infrastructure gaps are located away from the downtown core. Reiterations of the planning process will hopefully lead to optimized infrastructure capital and operating budgets.